Garlic Chicken with Orzo is a quick and easy dinner, made all in one skillet, and ready in 30 minutes. 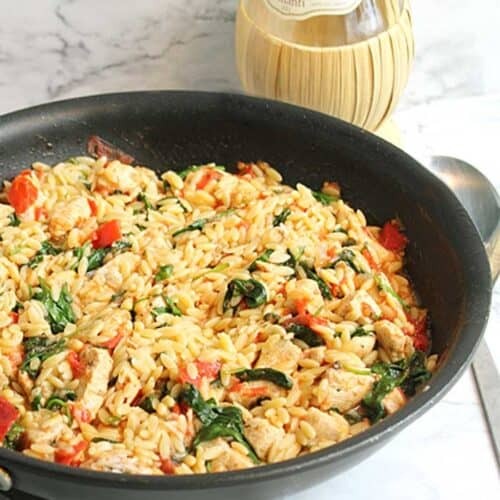 Moist chicken is combined with garlic, onion, tomatoes, spinach and orzo to give you a well rounded meal with little cleanup. Heat a large skillet with olive oil over medium-high heat. Saute onion for about 5 minutes or until soft & translucent. Add garlic and red pepper flakes and cook another 1 minute. Season chicken with salt & pepper and sprinkle with Italian seasoning. Add to skillet and cook about 5 minutes or until lightly browned and cooked through. Reduce heat to medium and add tomatoes and parsley and cook 5 minutes. Add spinach and cook just until wilted, about 1 minute. Add orzo and cheese and cook until cheese is melted. Add orzo and cheese and cook until cheese is melted (about 1 minute). Serve with additional Parmesan on the side.